Osprey mate for life and we believe that this is the same male-female pair that has been using this nest for many years. The top photo at left is of the male. 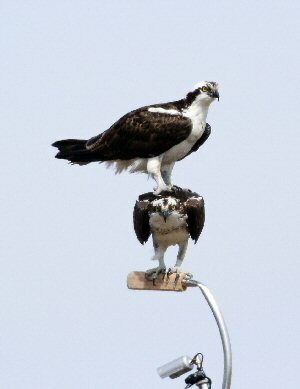 The photo just below is of the female taken a few years ago by Mick Cochran. You can see that the breast of a male is almost all white and the female's breast is mottled. At left is a photo of a male from the 2006 nest. Rhode Island adult male nesting on Conanicut Island (Jamestown). He was banded as a nestling in 2006 on Block Island about 25 miles (40 km) from his current nest. This nest, is 500 yds (460 m) from the Marsh Meadows nest, where we tagged a couple of young in years past (Conanicus and Comet). This is the second year the nest has been used and the first time the pair has laid eggs. We trapped Neale on 5 May, the first day of my trapping odyssey. Our target nest was the Marsh Meadows nest, where the Conanicut Island Raptor Project maintains a NestCam. Unfortunately, when we got to that nest, we discovered that the birds had not yet laid eggs, so we had to move on to find birds that were incubating. The next nest we checked, at the back end of the marsh, looked good. The female was incubating and the male was around, so we got to work . We set our ladder and put the noose carpet over the 3 eggs. Within minutes a bird landed on the noose carpet and was caught. When we picked him up, I thought he looked awfully small (meaning it would be the male), but because we almost always catch the female first, we weren't sure. So we set the other noose carpet and went back to take some measurements on the bird in hand. While we were moving away, we caught the other adult. We did indeed catch the male the first. We quickly banded and measured the female and let her go so she could get back to incubating the eggs. We then processed "Neale" and outfitted him with his new transmitter. Neale's nest is on the Neale family farm on a pole the Neale's set up, so the name choice was an easy one.